We’re told that with a metropolitan population of some 25 million, Seoul not only makes up around half of the population of South Korea, but is also the fourth largest city in the world. Several times the size of London or Paris, this vibrant and futuristic metropolis – our home for the coming days – is truly a city that never sleeps. We discover that it is not uncommon to find its fashion-conscious inhabitants shopping until 5am at the likes of the Doota mall in Dongdaemun, or to see them piling into hip-hop clubs in the popular student hang-out area of Hongdae. At a K-Pop concert for ‘Red Velvet’, whose work you are no doubt familiar with, we see hysterical fan club members restrained by security for their over-zealous photographing of the performance. In a city as vast and electrifying as this, there’s a lot to discover, but we decide to start out with a beer. 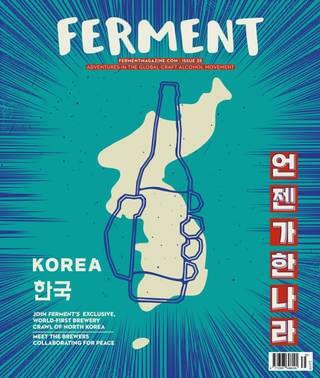 In the most international part of the city, Itaewon, we check out one of the many hip craft beer bars, Namsan Chemistry. Koreans love to eat and do so communally, so we soon realise that at every place we visit, we’ll be having a small banquet along with our beers. Not that this means we won’t also visit some restaurants along the way and even the Gwangchang Food Market, the best place to try authentic Korean street food. We visit an upmarket whisky bar in the well-to-do Sinsa-dong district, surrounded by luxury boutiques and high-end restaurants. On side streets we drink cheap soju from green bottles over kimchi pancakes and soak up the friendly atmosphere of drunk Koreans. On the final night of our trip, the brewers take us on a tour of their favourite spots. Starting off at Seoul Gypsy Beer Co, we discover a pineapple and coconut New England IPA. Something like a piña colada beer, it is outstanding. 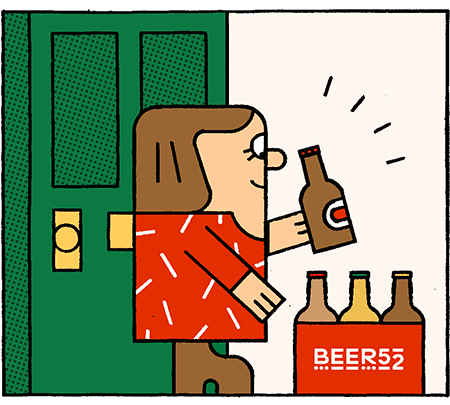 We later swing by Euljiro Brewing, whose hilarious illustrations celebrate inebriation in the cutest of ways. Winding up the evening at Beezza Brewone, we have a final round of beers and pizza and realise our jetlag is getting the better of us, so it’s time to bid farewell to our hosts and hit the hay. Gwangchang’s reputation as one of Seoul’s foodie must-sees is well-earned. One of the best places to absorb traditional Korean street food and culture, it’s best to set aside some time and go at your own pace; you’re going to want to try everything. It was founded in 1905, which apparently makes it the country’s oldest continually running market and, despite becoming world-famous, it still feels very culturally authentic, with tourists and locals tucking in with equal relish. Deep in the warren of narrow, neon-lit lanes that is Euljiro, Euljimaekog is a cool and cozy urban hideaway, with great food and a selection of booze from the likes of Euljiro Brewing Company, 304, Andong, Jeju and even a few imports. The décor is stripped back, with concrete floors, simple seating and a mix of plants and fluorescent wall art. When we visited, the music was great and added to the atmosphere of retro-futuristic chic. One of those bars that makes you feel like you’ve discovered a big secret; tucked away down a twisting back alley behind Jongo-5ga station, CraftRoo is actually a ‘hanok’, a traditional Korean style of home. You could walk straight past it if you weren’t looking. Aside from the bragging rights though, the beers alone should be enough to get you through the door, with brews from Hand & Malt, Gorilla, Brewery 304 and many more. Six-beer flights are available, along with a good selection of tasty bar food. Although not strictly in Seoul, Playground Brewery is well worth a visit or, if you absolutely can’t make it out to its home in Ilsan, at least keep an eye out for its beers. Founded in January 2016, Playground achieved rapid success with its brews primarily based on locally-available ingredients. It’s most popular seasonal for example, Ruby Saison, uses the distinctively floral Korean black raspberry, abundant in the Ilsan region. As the name suggests, Sour Pongdang offers something a little different to the usual lineup of lagers and pale ales, without having to venture too far from the beaten track. A stone’s throw from Woori Super, The Booth and Magpie in the Noksapyeong area, this bar has a tranquil, almost magical atmosphere, which perfectly matches the weird and wonderful lineup of sour and speciality brews from Korea, the US and Europe. ts bottle selection is particularly impressive, with plenty to please the sour newbie, as well as more challenging, funky, lip puckering brews for the veterans. If you want a more cerebral beer drinking experience than you’ll find in the bustling bars of Itaewon, this might be just the spot for you. Having started life as a pop-up project funded by a local artist, Namsan Chemistry has evolved into one of the area’s coolest craft bars, again within rolling distance of both The Booth and Magpie. Given what a hot-spot Gyeongridan has become, it’s perhaps unsurprising that Nasam Chemistry has chosen to focus firmly on the home-grown brewing talent, showcasing the sheer breadth and depth of South Korea’s craft scene at very reasonable prices. There’s decent (if standard) bar food on offer too – again, great if you’re on a budget – and the aspect from the back of the bar gives an excellent view of the Namsan Tower. The bar has genuinely broken new ground in Seoul, and is a marker for just how well-developed the local beer scene is. Not only does it have 40 taps, pouring a wide range of predominantly local brews, it is also the first bar in Seoul to offer crowlers of your favourite beer to enjoy at home. What’s more, patrons choosing the takeaway option get a hefty discount from the standard bar price, making the whole proposition even more appealing, though the bar does advise that canned beers are best consumed quickly to maximise their freshness. Occupying a prime spot in the fashionable Gangnam district (which you may have heard of) Beezza and Brewone have come together to create this moody, ultra-cool basement bar that feels like entering another world. There’s a great range of beer and food on offer, with interesting bottles from a plethora of great international breweries complementing the hosts’ own beers and other local treats on tap. Like Beezza’s other Seoul venues, the food here is great, led by thin-and-crispy-based pizzas, which is just how we like them, with a choice of classic and creative toppings.